In Washington, the Senate is getting ready to vote on the Republicans’ new legislation which would repeal and replace the Affordable Care Act. This bill, the American Health Care Act (AHCA), would also strip important federal funding away from special education programs in public school districts around the country. For the last 30 years, school districts have received reimbursements from the federal government via Medicaid, a program that provides health services to low-income Americans, particularly mothers and children. It’s estimated that school districts around the country receive around $4 billion in Medicaid reimbursements to help cover the costs of special education programs each year. In Chicago, CPS receives around $48 million each year through this program. Medicaid dollars pay for many of the services and professionals that make special education programs possible, including speech and physical therapists, transportation services, social workers (the importance of which has been discussed previously on A Just Chicago), as well as necessary medical equipment like feeding tubes. Under the AHCA, Medicaid would be gutted and low-income Americans will lose $880 billion in services over the course of 10 years. Right now, Medicaid reimbursements are the only federal revenue available to CPS that is not capped, meaning the district can receive funding for as many students as is necessary. The AHCA would change that, forcing school districts to ration health care services. Medicaid cuts will hit Chicago students especially hard, since CPS has already refused to provide their special education students with the bare necessities. 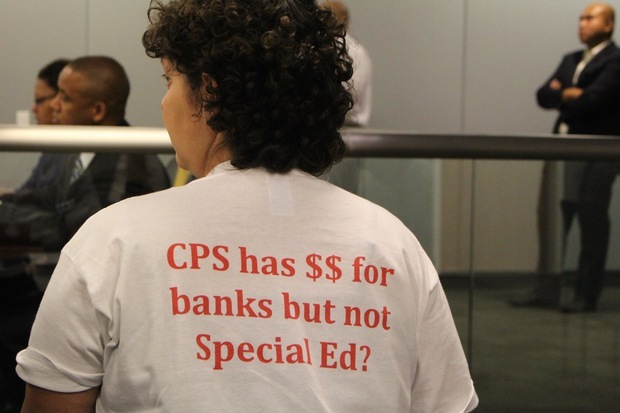 Late last year, the Better Government Association published a report detailing the ways that CPS has been withholding necessary services and funding to students with IEPs in an effort to save money. CPS cut transportation services, informed parents of special needs students that their children no longer required an IEP and thus didn’t qualify for special education services, and rolled out new eligibility requirements and red tape in an effort to discourage parents and teachers from enrolling students in special education programs. Low-income Americans will lose $880 billion in care over the course of 10 years. Meanwhile, schools are so short staffed that some students with IEPs receive zero services during the day. In a survey of 900 CPS special education members, 90 percent reported that their school had been impacted by cuts to special education. While teachers and parents are struggling to get their students enrolled in the services they need, the city has slashed special education spending while simultaneously attacking teachers who speak out on behalf of their students. Now, our students stand to lose even more as Congress pushes a health care bill so draconian, Congress members themselves are exempt from it. health care, special ed, special education, Trump. Bookmark.